Finally a electric ride on car for the entire family to enjoy. 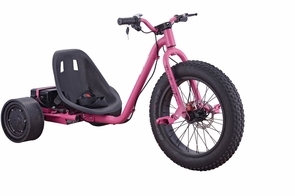 Holds up to 175 pounds and is great for any size rider. Perfect fun for children, teens, and adults. Strong 36 volt power plant with almost 1000 watts will have you reaching speeds of up to 15 mph. Plus, we give you a special key to that allow you to start or lock the vehicle. Measures 29" long x 24" wide x 14" high and the super durable frame is made of steel. Comes standard with a front disc brake, half twist throttle for safety, battery meter, and real rubber street tires. Featuring tall handle bars and retractable foot pegs. Buy today and the electric ride on racing car will arrive with rechargeable battery pack and charger. Available in blue, black, red, and pink. Arrives almost completely assembled.